Depiction of George Bonga from the Black Studies Centre, Montreal. Hundreds if not thousands of books and articles have been written on the North American fur trade which began when French and Indian traders began exchanging goods (and culture) in 17th century New France. The fur trade encompassed a massive swath of North America and lasted well into the 19th century when it peaked and began to decline due to changing fashions, poor business practices, and depleted animal populations. 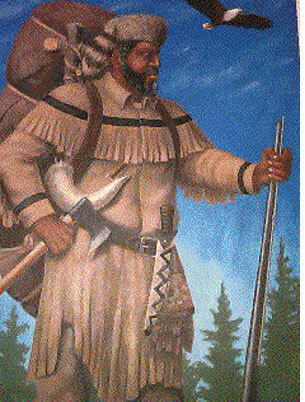 The French Canadian/Métis voyageur is a kind of North American archetype, an image that is very vivid, while the reality these frontiersmen and women experienced is usually much more cloudy for most people. The life of a voyageur is recounted romantically in Grace Lee Nute’s The Voyageur as difficult but also the happiest of lifestyles full of pleasure and independence. Today there is an active voyageur reenactment culture found in the Great Lakes area and Quebec. This intermarriage created extensive kinship networks and communities made up of French and Indian families in the fur trade territories. Scholars have written about this topic extensively. Less well-known however is that there were also people of African heritage who were part of the fur trade and part of these same kinship networks. There is a great deal known about voyageur culture. What we know about the group as a whole comes from music, songs and stories passed down in an oral tradition, artifacts, paintings done by contemporary artists and even some photographs of voyageurs who lived into the late 19th century, and records in the form of journals, church registers, and contracts. Very little, aside from the oral tradition, comes directly from the perspective of the voyageurs’ own voices. Rather, the life of the voyageur is recorded by their bosses and others who observed them at work and leisure. Relatively little is known about the lives of individual voyageurs, save for their major life events and work-related affairs that were recorded in church registers or by notaries. A few notable individuals allow us a glimpse into their lives, but these are exceptions to the rule. This is the case for French Canadian, Métis, and Indian voyageurs and the same can be said for the fur trade workers of African heritage. If the average French Canadian voyageur worked in relative anonymity as they paddled their routes and labored under heavy loads across portages, so too did the Indian, Métis, freedmen, and slaves. The role of African-Americans in the fur trade is further shrouded by two factors: slavery and the small number who are known to have worked in the business outside of slavery. However, their roles in the fur trade are not completely unknown, even if there has been very little research done on this particular topic. The only academic article I have been able to find is Kenneth W. Porter’s “Negroes and the Fur Trade” published in the December 1934 issue of Minnesota History. Most of what I have found in addition to this are recaps of the Porter article, works for a juvenile audience, or mentions in broader works on African-American history. According to Porter, people of African heritage occupied all roles in the fur trade, from indentured servant or slave to independent trader. One example that shows with great clarity the possible progression from slave to prominent trader is the Bonga family. Pierre Bonga (or Bonza) was a servant to Alexander Henry, the commander of the Northwest Company’s Red River Brigade. Pierre was the son of Jean/Joas and Marie Jeanne, slaves belonging to Daniel Robertson who was a British commander at Fort Michilimackinac at the Straits of Mackinac. Pierre Bonga was considered extremely trustworthy by Alexander Henry and was invested with authority enough to be left in charge of the fort in Henry’s absence. He eventually married an Ojibwe woman and later worked as an interpreter. 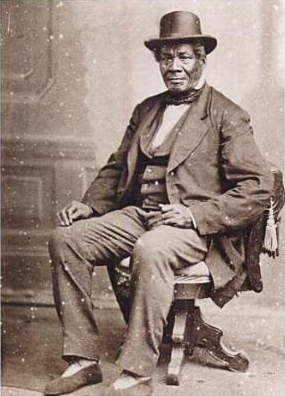 George Bonga in his retirement, from Making Minnesota Territory, 1849-1858. St. Paul, MN: Minnesota Historical Society. Their son George was born near Duluth, Minnesota in 1802 and was educated at Montreal. He later joined the fur trade, serving as a voyageur, interpreter, and ultimately becoming an independent trader in his own right. See this article at the African-American Registry for further details and an article on George’s brother Stephen at the Wisconsin Historical Society. Yet, slavery eliminated the possibility of advancement for many Blacks, just as the average French Canadian was held back due to their (frequent) indentured status, limited literacy, and other factors. The experience of Black and French Canadian fur trade workers is parallel in other ways, including their intermarriage with Indian tribes. Intermarriage meant African-Americans became part of the widespread racially and culturally métis (literally “mixed” or creole) network that included towns throughout the Great Lakes, Illinois country, and Canada. The church registers of fur trade centers like Detroit and Michilimackinac attest to the presence of many more Black men and women in these areas, forced to work undoubtedly for the elite traders of the times. These were people whose lives were spent, in part at least, laboring alongside Panis (Pawnee) slaves. They were sometimes named, but most often referred to by their function (slave) even as their life events were deemed vital to record by the Catholic authorities. The history of Black Americans in the fur trade is not only one of slavery, although that is a central element. There is also the story of successful voyageurs, who made lives in the wilderness, and found a place in history through their business acumen, intelligence, strength, and courage. Porter lists numerous other Black members of the fur trade who rose to prominence in their day, working at St. Louis, Chicago, in towns along the Mississippi, and travelling throughout the West. Many materials are available for a scholarly examination of the role of slaves, freedmen, escaped slaves, and Black Métis in the fur trade. While they were not engaged in such great numbers as French Canadians and Indians, their contribution is nonetheless a significant chapter of the fur trade story. And this is, ultimately, the story of the North American frontier and the birth of new cultures along the voyageur routes from Quebec to St. Louis and beyond. My thanks to the librarians at the DuSable Museum of African American History and the Chicago History Museum for responding to my queries. This topic is itching for a thoughtfully made, independent film project, perhaps a character study of one person’s or family’s experiences. Thanks for another great blog entry, cousin! Thank you Micheline – I agree he’s an interesting character which comes in part from the fact that he really stands out. So few personalities from the fur trade really stand out. I love the idea that his name is a form of bon gars… I’m going with that! James, I LOVE your blog! Keep up the good work. In the area of the upper northwestern French speaking triangle of Louisiana, we successfully had a resolution declaring Bastille Day, July 14 as our Louisiana Multi-ethnic Creole Families Commemorative holiday and it was approved as SR-30 in April of 2013, compliments of my cousin Senator Eric LaFleur, District 28 of Louisiana. I was honored to have written this wonderful document which is in fact a panorama of historical and ethnic groups which constituted the Louisiana French multi-ethnic identity and which lives on today. Thank you for your work and please know that I am recommending your blog and sharing/spreading it via FB. Thank you again for reading and sharing my blog. Maybe we need to think about joining forces and instigating a national Franco-American day. It’s an idea that’s been bandied about. Sorry for the delay in responding. My mother passed away and so I have not been tending to emails and blogs so much lately, but I’m now getting back in the groove a bit. What will you do for your commemorative day? This is a wonderful piece! Thank you for writing this very insightful and thoughtful account. that Sub Sahara African and perhaps North African are part of the Native gene pool. What a individual inherits is governed by randomness of genetic inheritance. Dear Mark – I’m not sure how your message went unapproved for 2 weeks – I apologize. I find that DNA testing is improving greatly over time, but has it’s limitations. My own Sub Saharan African DNA could correlate to the NA lines I have, but I have always suspected, before DNA, that I had African (in the past 500 years) ancestry through a line that I know is not Native American. Difficult to say really! Thanks for writing! The surname Bonga itself is amazing as it does not sound European in nature but rather a foreign sounding one, I googled this name and it showed various African related threads. Africans on arrival to North America were stripped off their tribal names and given European names as most of us know, So I am wondering was George Bonga’s African born ancestor a man of importance if he was allowed to keep his traditional African name, Can somebody clarify on this?